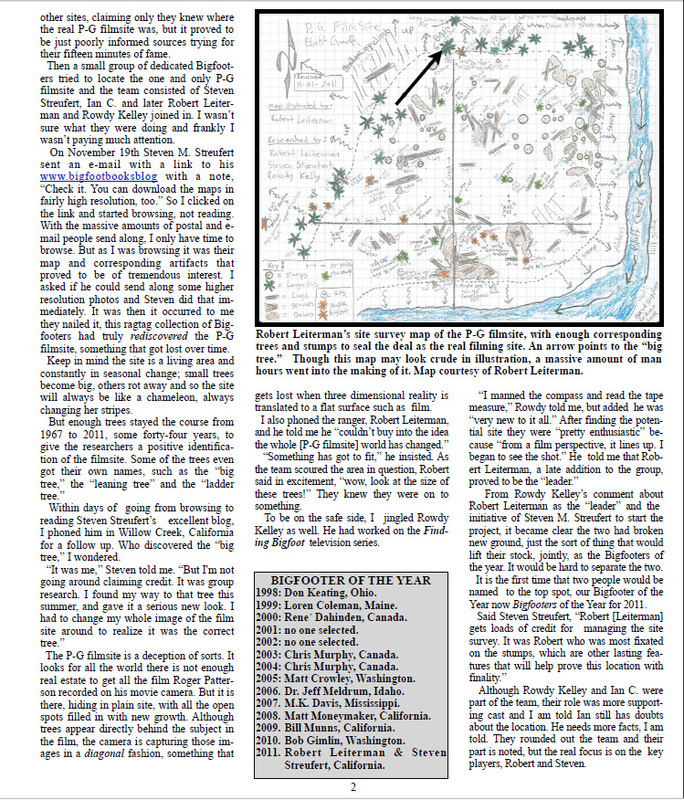 Click to Enlarge and Read, Right-Click to View Full Size or Save. 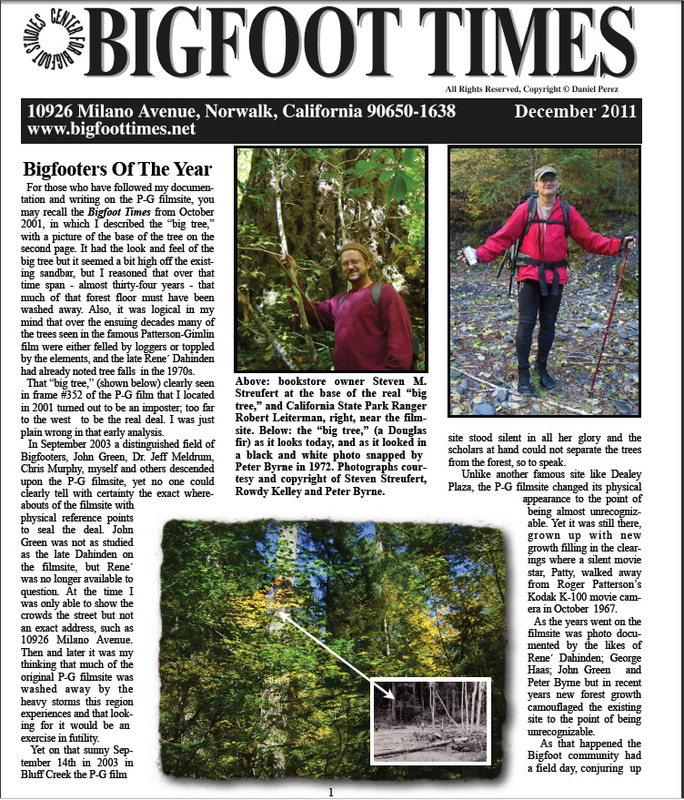 The 2011 BIGFOOTERS OF THE YEAR award has been announced by Daniel Perez, of THE BIGFOOT TIMES newsletter. 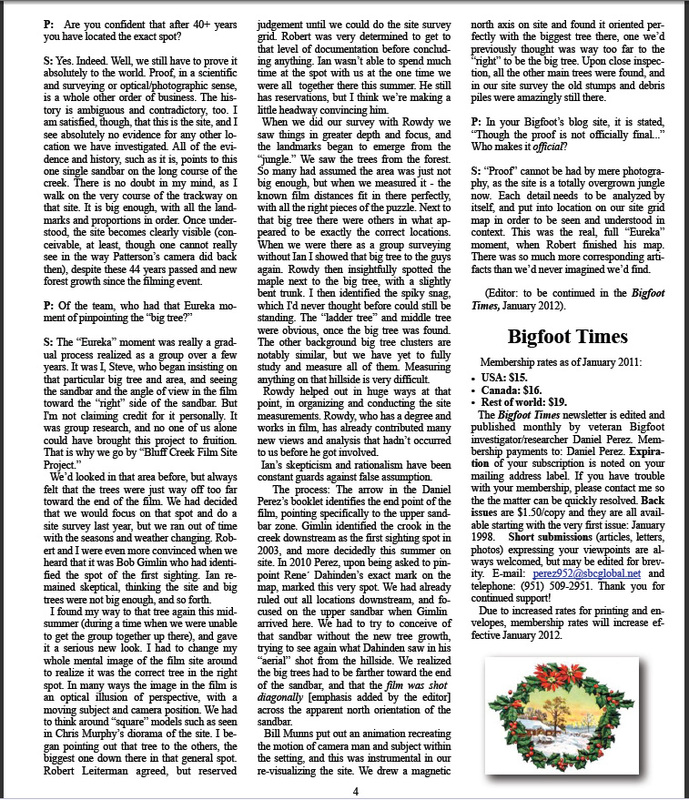 Here in this blog we will let Daniel tell the story with a free copy of the December issue. Click the images to enlarge and read them. 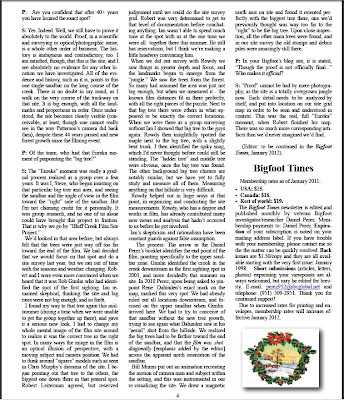 Robert Leiterman and I would like to say thank you to Mr. Perez for recognizing the value of our long labors on this issue of Bigfooting history and geography. We'd also like to extend this award and all the due credit for it to those who were also part of The Project, founding member Ian C. and concluding member Rowdy Kelley. Also, thank you to all of you who helped us along the way. To all of the naysayers up and down that creek, well, neener-neener to ye. 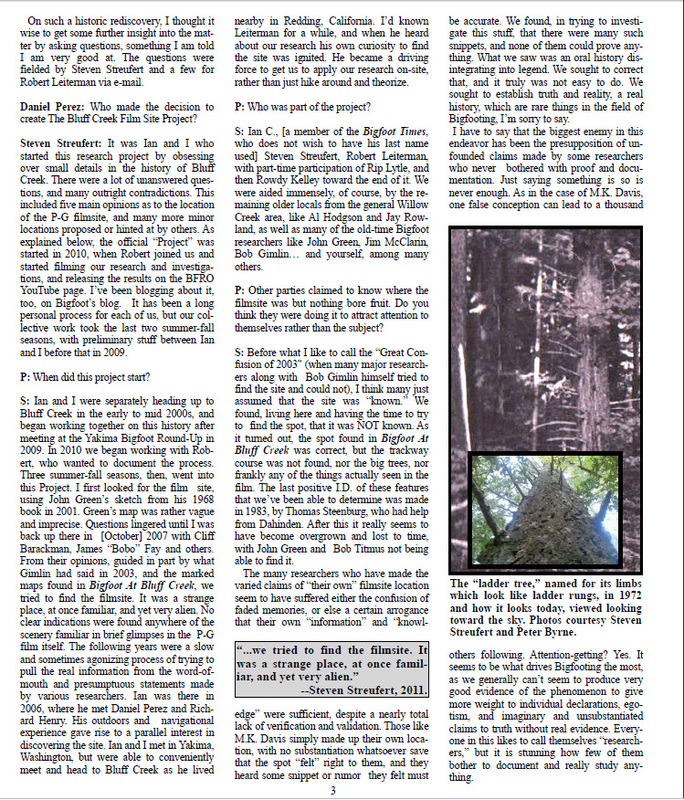 The long-lost-in-confusion site of the Patterson-Gimlin Film on Bluff Creek has finally been found, and definitively identified by the members of the BLUFF CREEK FILM SITE PROJECT. 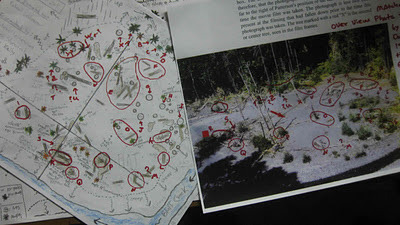 A mathematical proof using trigonometry and geometry has been done by a geologist, comparing our site map and the 1971 Rene Dahinden "aerial" photo of the site. The final draft of this in formal proof form is in, and after review will be posted here soon for all to see, in the next entry of this blog. Work will continue in the coming year, no longer to verify, but now to further explore and identify the aspects of the film site. We are planning a major congregation of researchers to arrive sometime in the summer for further analysis and documentation. You can probably expect a Season Three of our YouTube video series presentation. For now, see the first part of Season Two, below. 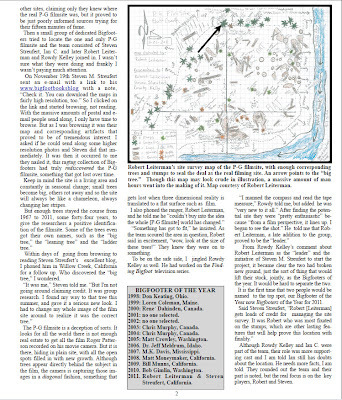 Also find below a preliminary statement from our site data analyst, a radio appearance I did recently, and a link to the new, revolutionary Facebook group that has been founded to fight the lunatic fringe in Bigfoot Research. 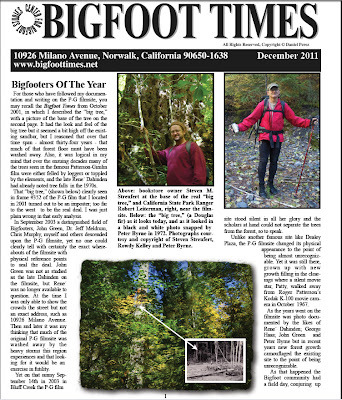 Page Four, THE BIGFOOT TIMES, December 2011 Issue. a holiday season gift from Mr. Daniel Perez, Bigfooter extraordinaire. 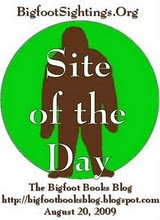 YOURS TRULY ON BLOG TALK RADIO, BIGFOOT TONIGHT. Recently I was the guest on this show, which you may access via podcast archive or streaming online. In it we mainly talked about the PGF and Bluff Creek issues, but of course this talk inevitably led to MK Davis calling up on the live show. He dug himself even deeper into a "bloody pool" and made a massacre of the historical truth. Little more than an hour after that on-the-air radio conversation, I received notice from MK's blog that he is RETIRING from Bigfooting. Well, I must have done something right, eh? All credit to the early work of Mr. Davis, and best of wishes to him in the future, but I am simply going to say here that: We Were Right. Bob Gimlin Was Right. Rene Dahinden was right. Season Two: The Bluff Creek Film Site Project Part 46, Old Bluff Creek Road. Out Now! NEW VIDEO: Bluff Creek Film Site Project, Part 47!!! The continuing melodrama of the BLUFF CREEK FILM SITE PROJECT. This is Season Two, brand new. Here you will find the "Devil's Advocate" episode. Part 48. Check it out! The continuing melodrama of the BLUFF CREEK FILM SITE PROJECT. This is Season Two, brand new. Here you will find the "Bickering in the Creek" episode. Part 49. Check it out! The continuing drama of the BLUFF CREEK FILM SITE PROJECT. This is Season Two, brand new. 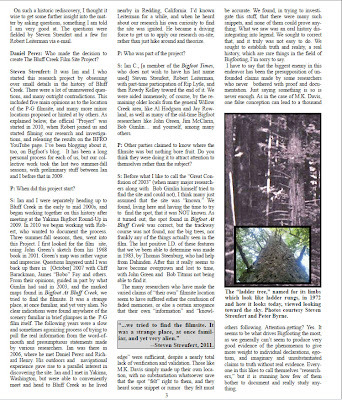 Here you will find the "Initial Considerations of the Bigfoot Trackway" episode. Part 50. Check it out! The continuing drama of the BLUFF CREEK FILM SITE PROJECT. This is Season Two, brand new. Here you will find the "Considering All Options ad Infinitum" episode. Part 51. Check it out! The continuing drama of the BLUFF CREEK FILM SITE PROJECT. This is Season Two, brand NEW. Here you will find the "Every Tree at the Edge of the Woods is a Possibility" episode. Part 52. Check it out! The continuing drama of the BLUFF CREEK FILM SITE PROJECT. This is Season Two, brand NEW. Here you will find the "Stumbling over Stumps and Right into the Big Tree Discovery" episode. Part 53. Check it out! The continuing drama of the BLUFF CREEK FILM SITE PROJECT. This is Season Two, brand NEW. Here you will find the "Discovery and First Analysis" episode. Part 54. Check it out! Videography by Robert Leiterman. Research by Steven Streufert, Ian C. and Robert Leiterman, with invaluable assistance in the endgame from Rowdy Kelley. Compared with the Survey Map of 2011. Forty Years, and Still There. "I did some quick trigonometric comparisons between the Dahinden photo and the new PG site survey and it looks like they match up pretty good. I only focused on the tree stump cluster marked J,I,G, and H. I was able to match it up to an accuracy of about 90% (just for that particular group). The lens on the camera from the Dahinden photo is distorted a bit from spherical aberration (about 5-10 degrees toward the edges of the photo) but i am pretty sure i got the interior angles fairly accurate. I'll work on it more tomorrow and see if i can use some other objects in the photo to compare the trigonometry which should bring it up around a 97-99% positive match. Might take me another couple days to do write a proof but it shouldn't be a problem. I'll e-mail you again tomorrow with some diagrams and calculations." 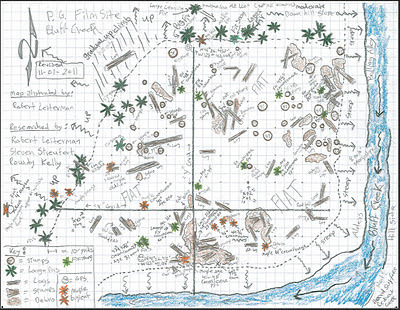 The Site Survey Map of the Now Known PGF Site. Not to brag, but THIS IS AN EXAMPLE of where Science, Logic and Reason may take us. Despite decades of false claims, we were able to prove more than just our opinions. And we documented it thoroughly in ten foot grids on a map that are now capable of producing real mathematical data. This is real PROOF. I hope that the lesson learned from this process, which took four years and is still ongoing, is that persistence pays, that it is worthwhile to do history, and that rational analysis is preferable to wishful thinking and egotism. If only we could apply such methods to finding incontestable proof and knowledge of Bigfoot, eh? JOIN NOW. Click the link above. That all me say to you now, hu-man. We talk when you read 200 email a day. It fun. You survive, you be worthy. You say, Bigfoot not serious about Science? Well, that true. Me just like to see hu-man brain hurt. Me just happy with good Bigfoot woman, good beer me steal from Book Man. Me not need Logic when me just live on land, eat what me find, pick cave and me sleep there. Some say Bigfoot "hu-man"... What, you diss me? 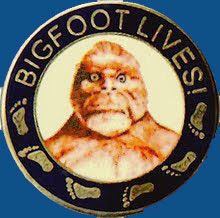 You not like Bigfoot get feeling hurt. Did you ever get a Forestrey Expert to dATE THE TREES AT THE 8' LEVEL ABOVE THE CREEK ? We did our own tree boring. There are NO trees old enough on the actual sand bar level to have been there in 1967, save a few at the back edge. They are all in the 35 to 40 year or less age range. This is further proof, as the 1964 flood basically killed everything where the water flowed.